Scientists have launched a petition which complains that physics education is being dumbed down. They have lodged a petition at 10 Downing Street calling for ministers to bring back mathematical rigour into secondary physics education. They complain that a new GCSE syllabus for physics focuses on debates on topics such as global warming and nuclear power instead of calculations. The regulator for England, the QCA, says the exams give a core of science. The petition - signed by 271 people - was started by a secondary school teacher, Wellington Grey. The London-based teacher, who works in an independent school, has posted an article about the GCSE changes on the internet which is being discussed by various online scientific communities. He wrote: "I am a physics teacher. Or, at least I used to be. My subject is still called physics. My pupils will sit an exam and earn a GCSE in physics, but that exam doesn't cover anything I recognize as physics". He says the changes to the physics syllabus have meant a shift away from precision towards the general teaching of "how science works". "In this course, pupils debate topics like global warming and nuclear power. Debate drives science, but pupils do not learn meaningful information about the topics they debate. Scientific argument is based on quantifiable evidence. "The person with the better evidence, not the better rhetoric or talking points, wins. But my pupils now discuss the benefits and drawbacks of nuclear power plants, without any real understanding of how they work or what radiation is. "The result is a fiasco that will destroy physics in England," he argues. The GCSE science curriculum was changed this academic year after a review. Scientists and the government were alarmed at the fall in the number of pupils opting to study science over the past 20 years. The focus of the new general science curriculum is now meant to be on understanding how science works and making it relevant to interest a wider range of pupils. 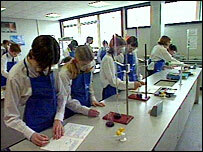 The expectation is that those with interest in further science study do an additional science GCSE. From 2008, all schools will have to offer three sciences for all pupils showing ability in the field (those working at level 6 or above). A spokesperson for the AQA exam board said: "Our specifications meet the new requirements for science set by our regulator, the Qualifications and Curriculum Authority, and are fully accredited. "The revised requirements place a greater emphasis on 'how science works'. This is the entitlement curriculum for every student: the focus is on scientific literacy with the aim of engaging all students." A QCA spokesperson said: "The new science curriculum and GCSEs provide a common core of science which all young people will need to understand the issues that will affect their lives. It also provides a thorough grounding for those who will continue studying science at A-level and beyond. "The vast majority of pupils will continue to study the equivalent of two GCSEs' worth of science: GCSE Science (the 'core') plus their choice of appropriate additional GCSEs." The Institute of Physics says it is too early to pass judgement on the new syllabus. The institute aims to encourage more pupils to study the subject at A-level. Daniel Sandford Smith, from the institute said: "It's too early to judge what the impact will be. We will wait to see what the impact on A-level take-up will be".